We love easy recipes because it means we can replicate them over and over again without thinking too much, searching for obscure ingredients, or spending all day in the kitchen. 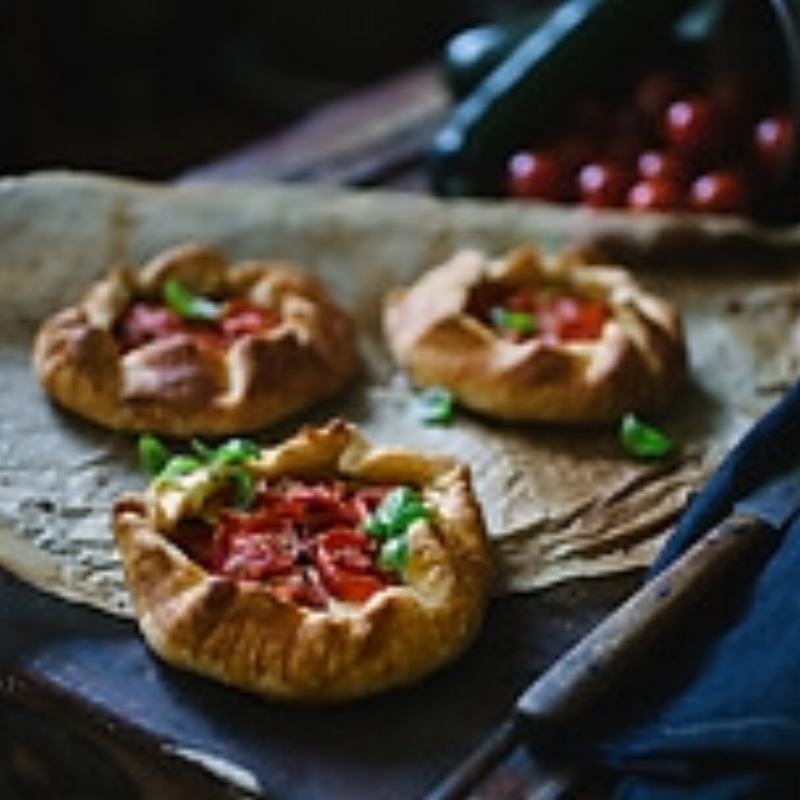 This tomato tart can utilize either frozen pie crust or frozen puff pastry - two items I adore - although I do recommend the puff pastry for a buttery, more delicate dish. The tart can be as big or small as you want - place a big, rustic tart on a wooden serving board and slice it at the table along with a simple green salad, serve bite-sized as an hors d'oeuvre, or meet somewhere in the middle and make small individual tarts as an appetizer, perhaps with a dollop of burrata on top! Melt butter in a skillet over medium heat and cook shallots until translucent, about 5 minutes. Drain on a paper towel and set aside. Unfold the sheet of pastry onto a lightly floured surface, gently roll out to a 9" x 11" rectangle, and place on a parchment-lined baking sheet. Prick the pastry all over with a fork, within about an inch of the edge. Sprinkle cheese all over the pastry, making sure to leave that inch of edge untouched, followed by shallots, and finally the tomatoes. Bake in the oven for about 15-17 minutes, or until the pastry is golden brown and cooked through, the edge is puffed, and the cheese is all melted. Set aside to cool for 5 minutes before cutting and serving. Top with fresh basil and a sprinkle of salt and pepper.